I love okra, but sadly I am alone in my love of this vegetable. 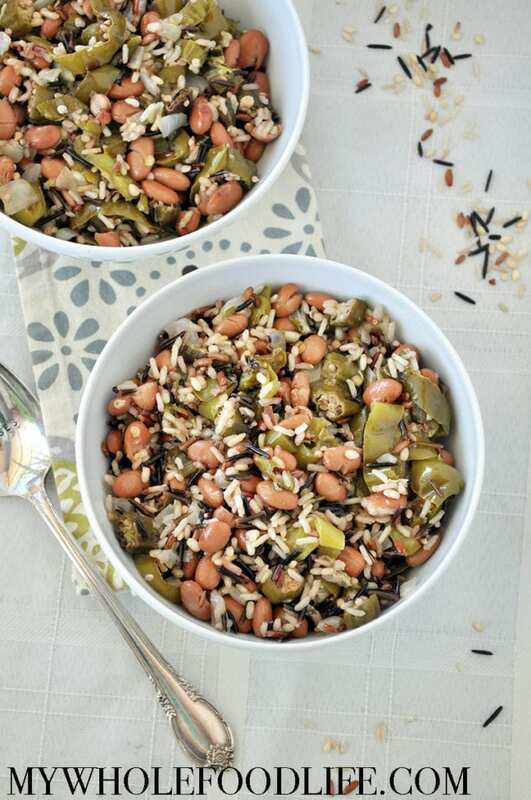 I included okra in this Pinto Beans and Rice dish to feed my craving. Not only is this simple to make, it comes with a bit of heat, which I also love. And while I know I don’t post much, choosing to mainly work behind the scenes of MyWholeFoodLife, I do plan on posting more of my creations in the future. Melissa and I are a great team, and we want to show everyone just how much we collaborate. Some of my other recipes are Eggplant Pasta, Mexican Quinoa and Squash Apple Soup. Enough about me, onto to the dish. This recipe is great for lunch. If you don’t like heat, green bell peppers would sub well. On the flip side, use jalapeños if you are looking for something a bit more spicy. This is a pretty versatile dish that I hope you love as much as I did. Anaheim peppers give this recipe a special flavor. Uncover the veggies and cook for another 30 minutes. As the veggies are cooking uncovered, bring the water to a boil and add the rice and cook until tender. Once the veggies and rice are cooked, add the minced garlic, rice, and veggies while hot and mix well. Add the pinto beans and mix together. This should last about 5 days in the fridge. It should also freeze well for later. Had a suspicion from your posted cook time that you were not using 'wild rice' as wild rice is actually not a rice and takes a couple hours to cook. The blend of rice you used looks good though, as does the entire recipe. Also confused about uncovering the roasting onions and okra when there is no mention of covering them? Are the peppers raw, like if you used green bell peppers, I'm guessing they be raw strips? Do the peppers go in with the okra and onion? I also wondering what u r supposed to cover them with and when? What kind of rice are u using looks like more than wild? Sorry about all the questions on the recipe. My husband wrote this one and it looks like he needs more training on recipe writing. :) I have edited the post to state the peppers go in with the onions and okra. I did use wild rice. It's a long grain wild rice. How do you cover something on a baking sheet? I've never done that and I have no pot lids that shape.